A new year has come, we ate, laughed and cried. It is time for other goals and also for the gym and an extreme diet. In coming days the Three Wise Men will return once again to bring toys for kids. 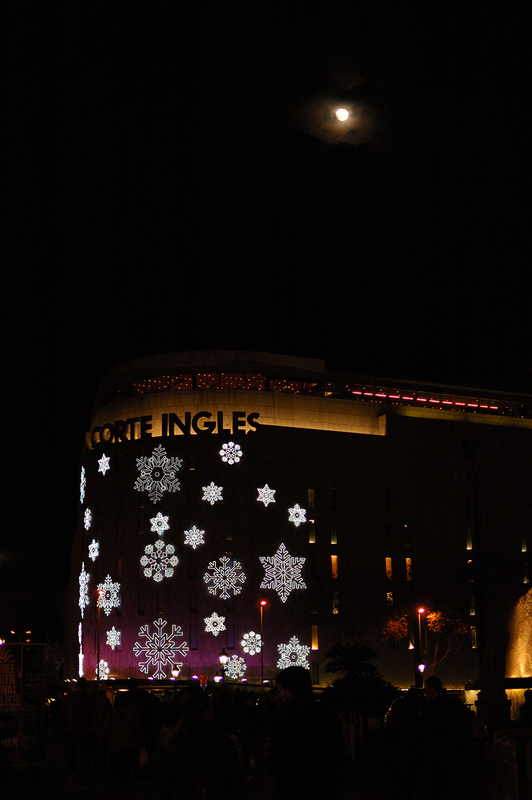 El Corte Ingles is one of those traditional department stores with a seasonal lighting: this was the way it looked some days ago for Christmas and I suppose they will set a different decoration for Los Tres Reyes Magos celebrations if they haven't already. I seldom visit this shopping center but you have to admit that their lights are a sort of traditional symbol in Barcelona and celebrations wouldn't be the same without the famous chain store. They spend a fortune I suppose but the full moon is free of charge. Linda imagen Carlos, también obtuve varias fotos desde esa misma esquina. Solo que sin la belleza de la luna que tú si pudiste captar. Bella imagen Carlos. Eso son las tradiciones, las luces, las tiendas y Los Tres Reyes Magos. Un abrazo. What a challenge to the light of the moon. Please have a nice new week.